Momentum is building in lower time frames. Since technical indicators are favorable and the streams of bullish fundamental prop prices, odds are Ripple (XRP) will trend above 40 cents in weeks ahead. The crypto winter may be biting, but that is not stopping major marketing moving announcements. Top of the list is XRP listing at CoinBase sating investors who have been for a long time agitating for a deserving support. The exchange recently announced their shift, and in the last couple of months, CoinBase has been aggressive, listing assets though critics maintain that their aggressiveness will water down their novelty. Unexpectedly, CoinBase support had a cooling effect and partly casting out doubts on whether investors were dealing with securities. There is no word from regulators. But in the meantime, Binance is not wasting time, dilly-dallying and instead they are clear that they will remain ardent fans of the third most liquid coin until there is a circular classifying the asset as a security. To that end, Binance Trust Wallet now supports XRP, and after offering fiat—crypto channel via Simplex, Trust Wallet will have the same capacity as the exchange since they have a partnership with Simplex. Add this to Ripple Inc commitment of promoting crypto in collaboration with heavyweights as IBM and Microsoft. It is increasingly becoming clear that XRP will be here as a solution in years to come. At some point today, XRP prices dropped below 30 cents as bulls failed to confirm yesterday’s bulls. However, there seems to be demand in lower time frames, and the result is a pin bar with a long lower wick. Since prices are still in range mode and bulls are yet to build on bulls of Jan 30, or Feb 8, our XRP/USD trade plans are valid. The longer this accumulation is, the stronger the breakout. It is when prices slide and convincingly close below 30 cents that bears of Feb 24 will flow in and invalidate our bullish stand. 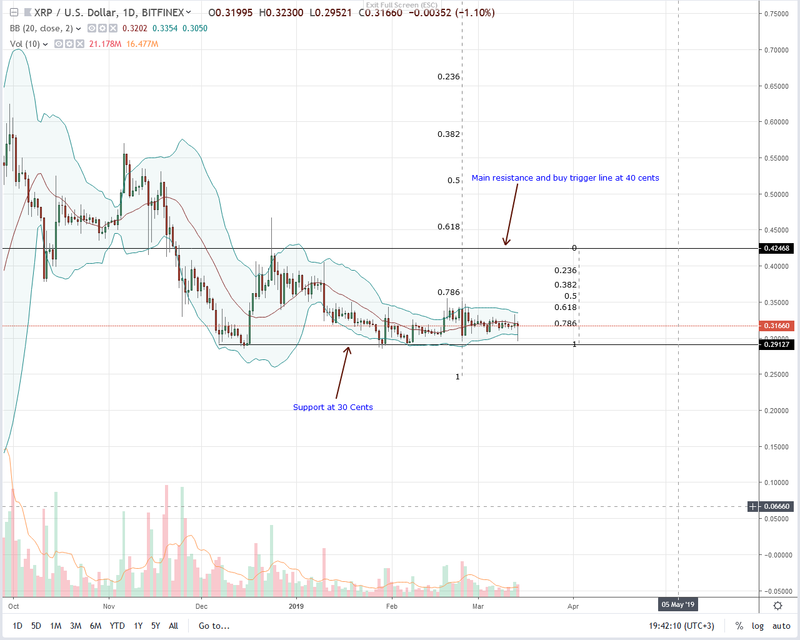 If not, all indicators point to buyers and as XRP prices steady in a 4 cents range, break above 34 cents will trigger demand driving them to new 2019 highs. Averages stand at 16 million—as printed after yesterday’s close. Triggers are at 34 cents and for buyers to be in charge as laid out in our XRP/USD trade plan, accompanying volumes must not print above this average but should ideally exceed bears of Feb 24—61 million.